*1968 in Thessaloniki, lebt in Kavala. Studium der Byzantinistik und Modernen Griechischen Literatur. Sie veröffentlichte zwei Gedichtbände, The Poet Outside, Agra Publications, 2004 und The Right to Hope, 2008, ein dritter erscheint 2016. Vertreten in verschiedenen Anthologien und den wichtigsten literarischen Zeitschriften Griechenlands. Sie publiziert kritische Essays und literarische Studien und kooperiert mit dem Philippi Theater Festival. *1968 in Thessaloniki, lives in Kavala. Studied Byzantine and Modern Greek Literature. She has published two poetry collections, The Poet Outside, 2004 and The Right to Hope, Agra Publications, 2008, a third one will be out this year. 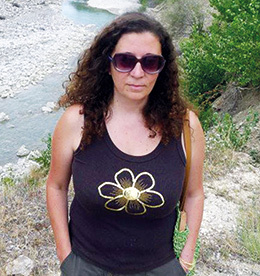 She publishes serials, critical essays and studies on literary themes, and cooperates with the Philippi Theatre Festival, one of the oldest in Greece. where the sage cast his sleepy eyelids. that cover the diaphanous skin with mist. on the natural failing of sight. making it hard for people outside to see in. and then I forget how and how much I kissed. and the blood to bubble. insinuating a pointed lapel or the theatre at Philippi. withdrew his eyes from her. In the distance there’s a town in balance. the town emerges from their depths. *The old name of Kaválla in Macedonia.